Does the timber bleed into a pool - I have a question about decking that leads over a pool without coping.Does the timber not bleed into the pool.? I love this look.but have been told that the timber bleeds ? Is that true. Some timbers bleed really badly. Choose the right timber for your application. Recycled timbers are good because the tannins have already been leached out. 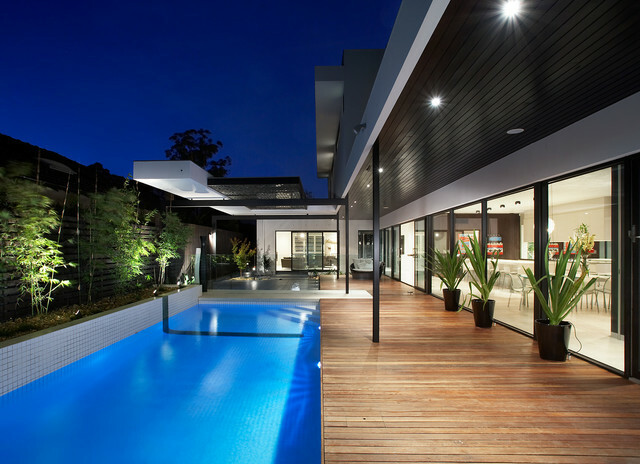 The timber used around this pool is Spotted Gum and Teak is good but expensive . Merbeau timber is the worst for leeching tannins so do not use this near your pool. Rule of thumb " the more expensive the timber the less it leeches colour "
What type of bamboo is this ? - What type of bamboo is this ? Hi. As the photographer I can't be too sure. Although I'd guess clumping bamboo.